The entryway to your home, whether through an open porch or sunroom, is the area that presents the first impression of your space. Your front patio or sunroom is also be where plentiful downtime is spent reading or resting, and where you entertain guests for coffee, tea, or apéritifs. Your patio space with set the mood for the rest of your home, and should emanate comfort and elegance. For luxurious decor, you will often see large hanging porch swings with an array of cushions, wide lounge chairs, and reclining chaises. Lighting should be kept soft and ambient, incorporating hanging lamps and candlelight. Adorn surfaces and corners with tall house plants, hanging plants, and flowers for an earthy, fresh feel, and keep surfaces clean lending room for books and beverages. 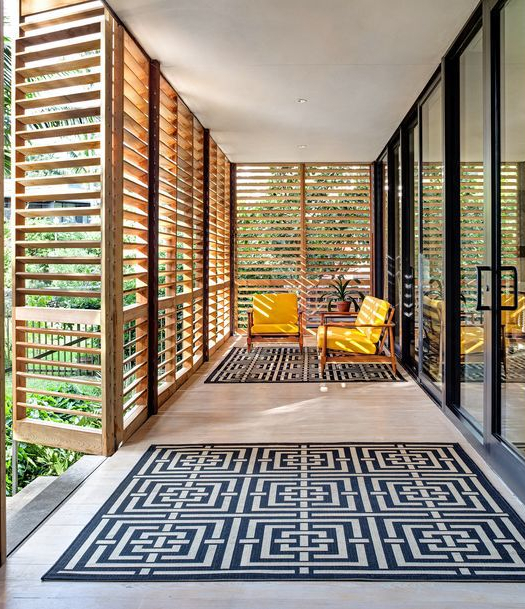 We hope you enjoy some of our favorite selections of modern luxury porches!